The most common conflict with squirrels occurs when they enter the attic of a house, though squirrels cause nuisance issues in other ways as well. Below we explore techniques to solve squirrel problems. In some cases, professional help is recommended. Squirrels are members of the rodent family. The most frequently dealt with nuisance squirrel is the Eastern Gray Squirrel. They measure around 16-18 inches from nose to tail and weigh approximately one pound. Gray squirrels are active year-round and arboreal, meaning that they live primarily in trees. They feed on a great variety of foods, such as nuts, seeds, fungi, fruits, and of course the seed in your birdfeeder. They store nuts and acorns in holes in the ground. Gray squirrels breed throughout the year, but there are two distinct peaks, in the winter and summer. After about six weeks, two to four young are born, and raised in a nest for about three months. They prefer cavities in trees (or homes), and when cavities aren’t available, they will build a nest out of leaves and twigs high in a tree. Squirrels have easily adapted to humans. They frequently use buildings as nesting areas. Squirrels love to break into a house and stay in an attic or soffit. They often find a small opening and will chew a wider hole to gain access to the building. They bring nesting material into the home, and make quite a bit of noise scurrying around and caching nuts. They often fall down the chimney flue and make a lot of noise or enter the fireplace. Sometimes they fall down a wall from the attic and get stuck. They often chew their way into commercial buildings or apartments. They often enter the attic through the gable vent. Squirrels can cause a fire hazard in homes by bringing in nesting material, and by chewing on power lines. 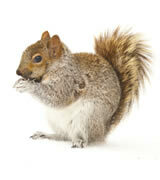 Squirrels can leave behind a lot of droppings and urine in the attic. The droppings not only smell bad, but they pose a biohazard, and the smell attracts new squirrels.